The church is unusual in having a rood screen across the nave with decorations of an earlier, pre-Reformation character (Period 3?). The shorter screens which continue its line to north and south (4b & 4c), dividing the aisles from the small chapels to their east, have decorations in Renaissance style. This could suggest that they (and therefore the aisles) date from the period after 1536 when Henry VIII broke relations with the Catholic Church in Rome by marrying Anne Boleyn, but before c.1549, when the English Reformation was complete, with changes in liturgy which rendered screens between the congregation and the priest an anachronism. 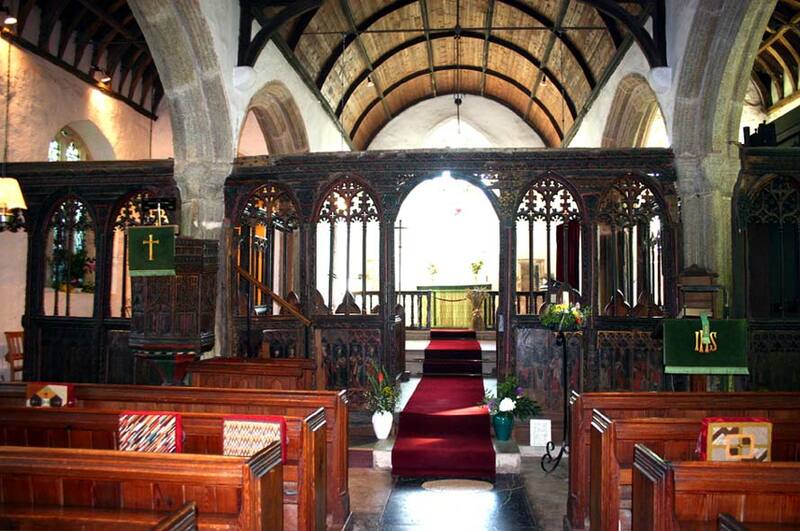 The rood screen was built for the original church hence the fact that it doesn’t fit perfectly in the new structure. There were probably wooden casements around the pillars to hide this. This means that the outer sections of the screen are slightly later (1536 -1549). They don’t have saints depicted on them as this was in the early days of the reformation and papist adornment was no longer acceptable. They have arabesques painted on them. [Robert Waterhouse December 2017 quoted from Kate Jennings’s book: East Prawle through the Ages.